Many holding office, especially those on the left, continually beat up and demonize all the good things our nation stands for or anyone with an opposing viewpoint. They use our tax money to subject us to a continual parade of freak shows whenever they want to shove new legislation down our throats. As Rush Limbaugh has said on a number of occasions, they are ‘waging war’ on the very people they were elected to serve. The Obama Administration’s assault against Christianity continues after an order was issued for the removal of crosses, this time from a military outpost in a remote part in Afghanistan. The official line is that one soldier complained, prompting the American Atheists to get involved. 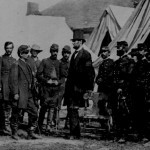 Seeing our President desires to imitate Abe Lincoln lets take a look at his order to the military on November 15, 1862: The President, Commander-in-Chief of the Army and Navy, desires and enjoins the orderly observance of the Sabbath by the officers and men in the military and naval service. The importance for men and beast of the prescribed weekly rest, the sacred rights of Christian soldiers and sailors, a becoming deference to the best sentiment of a Christian people, and a due regard for the Divine will demand that Sunday labor in the Army and Navy be reduced to the measure of strict necessity. The Source of our blessings and protection is being removed by design. This is a crucial battle and all the more reason why every Christian needs to step up. Our Founders never intended for our rights, including the worship of Jesus Christ, to come under such an assault like this. This will be a very difficult task that will take many political cycles to correct. Yet, it is our duty as Christians to stand and attempt a return to our founding principles. If we don’t, I believe God and future generations, will hold us responsible. This entry was posted on Sunday, January 27th, 2013 at 8:53 am	and is filed under Religious Heritage. You can follow any responses to this entry through the RSS 2.0 feed. You can leave a response, or trackback from your own site. I have great respect for Abraham Lincoln. I have studied him and the Civil War in college and since those days. It sickens me to hear Obama compare himself to Lincoln. He definitely is no Abraham Lincoln!! After seeing the movie, “Lincoln,” my exchange of words to a lady as we walked out of the theater was just that–the lady agreed. Yes, Christians have a great task before them. We must stand together and be ready for the task ahead as God gives us orders. My prayer is that Cahn’s words spoken at the Presidential Prayer Breakfast (which are from his book, “The Harbinger”) will motivate Christians across this country to begin a movement where we stand for God’s laws and the principles our Forefathers set before us. I agree that Christians need to take action, but it begins in the Pulpit. We need the Pastors to direct us according to God.